The meeting was held at Colliers Wood Library, and chaired by Councillor John Dehaney. 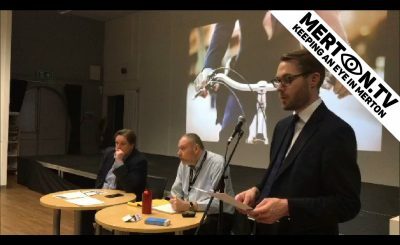 Twelve residents attended, as well as three other Merton Councillors. The Chair welcomed everyone to the meeting. 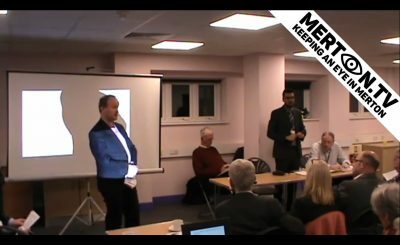 Abbas Mirza, spoke about the Merton Clinical Commissioning Group’s plans and the conversations they have been having with residents. A presentation is available in Appendix 1. Councillor Stephen Alambritis provided an update and responded to questions. Finances across local government remain stretched and Merton was no exception. The latest Medium Term Financial Strategy shows that there is a budget gap of £19m from 2019/20 to 2022/23. This would be met through a mix of savings and income generation. Much of the cost pressures relate to Adult Social Care where the Council has a statutory duty to provide for some of the most vulnerable people in Merton. The Council has invested an additional £9m in Adult Social Care to help meet these challenges. Children’s services where the Council is a corporate parent to 135 children and young people are also a high priority. The recent Ofsted inspection found that the Council was good with outstanding features and one of the top ten authorities in England. Working in partnership with other boroughs has also helped reduce costs. Merton leads a legal services partnership on behalf of four other boroughs; shares regulatory services like licensing across three boroughs and has even let out three floors in the Civic Centre to colleagues in the NHS. Renting out parks has also brought in additional revenue but can cause residents concern which the council is sensitive to. The new dementia friendly library in Colliers Wood was recently short-listed for the 2018 Library of the Year award. Wimbledon Arts Space is booked up until 25 November and will have a ministerial visit on 11 October. The Council has created an additional 4400 extra primary school places since 2010 by extending 23 schools and a new secondary school, Harris Wimbledon, has opened in the former adult education site at Whately Avenue. The school will then move to a new building on High Path in South Wimbledon for the 2020 intake and is already oversubscribed. There are now 15 outstanding schools in Merton, including the most recently Harris Morden, a school which had previously rated as inadequate. The Council’s School Improvement Team continues to work across the borough to support schools. In last year’s GCSE results Merton had the highest scores for the Progress 8 school which measures progress from Key Stage 2 to Key Stage 4. Cllr Alambritis thanked all those who volunteered in Merton. Volunteers are an essential part of life in Merton and he was pleased that the Cabinet had just agreed to continue to support the voluntary sector through a new Strategic Partner Funding Programme. The use of Landfill needs to stop and the new rubbish and recycling service beginning on 1 October should help increase the amount of household rubbish is recycled to over 45%. The new system should also save £1.6m in the first year, £2million a year thereafter and reduce litter on the street. The street cleaning performance of Veolia has not been good enough, and we are sorry for that. In 2017/18 we deducted 10% of the contract value and will do again this year if necessary. In response to questions about the new scheme Cllr Alambritis said that this was a four borough contract and was similar to many other schemes across the country. Veolia have allocated more resources and if more resources are needed for the contract management this will be looked at. 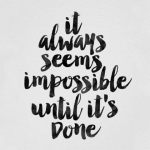 There is no specific time frame for when problems will be resolved but we will be looking for continual improvement. The Council will also be doing more enforcement to reduce litter including naming and shaming those penalised for fly-tipping. The Council is also looking to introduce a licensing scheme for landlords which will require them to make sure adequate refuse collection facilities are provided. Cllr Alambritis was asked about Colliers Wood Community Centre. He had spoken with officers about the broken boiler and whist we waited for a new one to be installed temporary heating would be provided. A resident asked about growth in Colliers Wood as Greater London Assembly is predicting no growth in the area and what will the Council being doing to support the area. Cllr Alambritis said that Colliers Wood has been doing well, and across London it is expected for areas close to transport to see some intensification. The Council will work with residents to manage this. A priority for the Council is Bridging the Gap, reducing inequalities in health outcomes across the borough and that drives where services are targeted, not where council tax has come from. Transport for London will shortly be consulting on options for a new transport link to Sutton and one of the choices is a route to Colliers Wood. A resident asked about air quality and support for schools in areas with high levels of pollution as they were against the building of the new Harris School on High Path because of the negative impact of pollution on students. Cllr Alambritis said air quality is taken very seriously by Merton Council with a new Air Quality Action Plan. This includes introducing a levy on diesel cars as well as increasing the number of electric charging points. Merton will work with the Mayor of London wherever possible to address these challenges. Leonie Cooper, Assembly Member for Merton and Wandsworth, provided an update on the work of the London Assembly. On air quality Leonie said that the Mayor of London has helped make this a clear priority and an important issue. The Mayor had been to visit Putney, one of the most polluted areas in London, and that had prompted action including cleaner buses. Other changes have included the new T-Charge and from April 2019 the Ultra-Low Emission Zone and the Mayor of London’s Transport Strategy is prioritising opening up streets to communities by removing cars. The Transport, Environment and Housing Strategies will need to work in conjunction with the new London Plan. In London it is impossible to avoid building schools in polluted areas but other things can help including planting, healthy streets around the schools, remodelling transport and cleaner vehicles. Looking at other forms of pollution is also important, for example construction, the Environment Committee, which Leonie chairs had made some recommendations to the Mayor for new approaches to reduce impact. Cllr Cooper-Marbiah said that in the case of the Harris School on High Path there would be planting on Merantun Way, a filter on the new building and access would be on High Path, away from Merantun Way. A resident asked about the lifting of the cap on borrowing against assets for local authorities. 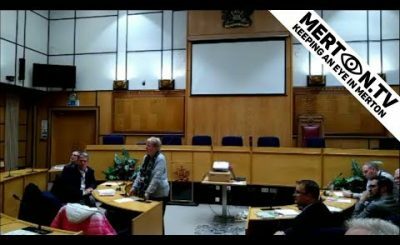 Leonie said this wouldn’t help council’s like Merton who no longer have any stock but the Mayor would be looking to work with boroughs to make the most of any opportunities to increase the supply of social housing. A resident asked about cycling and Leonie said that as more intensification takes place the Mayor will be looking to ensure sufficient cycle storage is provided in new developments and to work with boroughs to approve current provision but understands how much pressure Councils are under. Anyone with further issues they would like to raise with Leonie they are welcome to email leonie.cooper@london.gov.uk. Councillor Dehaney thanked residents for attending and closed the meeting. The next meeting will be in October 2019, date to be confirmed. Community Forum meetings are for anyone with an interest in the local area. They are chaired by local councillors. Issues raised are referred to the responsible organisation to follow up and report back on how problems are resolved. The Colliers Wood and North East Mitcham Community Forum meets annually each autumn. The current chair of the Colliers Wood and North East Mitcham Community Forum is Councillor John Dehaney. Join the Colliers Wood Community Forum Facebook page to find out the latest newest and join the conversation.